In early 2014, at the beginning of a pivotal year in his reelection bid, Mayor Rahm Emanuel's schedule was packed with meetings and events. But many of them were closely guarded secrets. For example, on February 11, 2014, one of his first appointments was a 9:30 AM meeting described on his schedule as "coffee with friends." The friends weren't identified, though the event was held in the mayor's City Hall office. 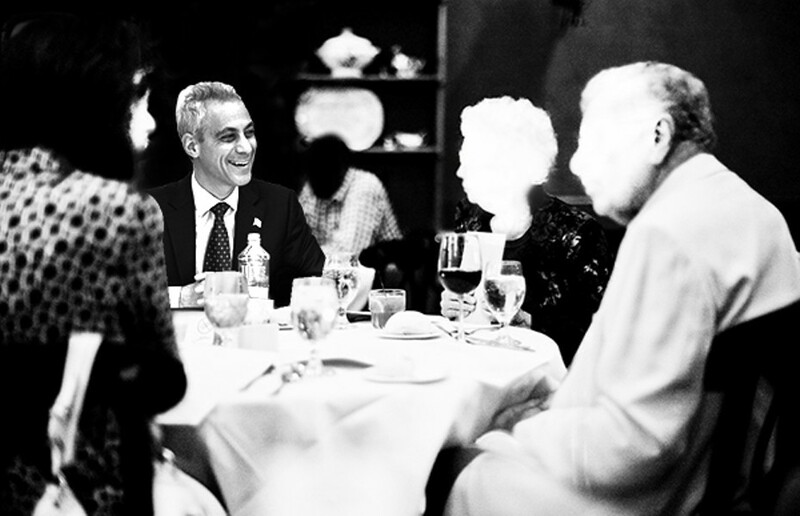 At noon the mayor went to Coco Pazzo—one of his favorite Italian restaurants, on West Hubbard—for a "non-city lunch." His companions weren't named. At 5:30 PM he headed to Gibsons steak house for another "non-city" event, followed by a "non-city meeting" at the nearby Erie Cafe. Even Mayor Emanuel needs to sleep, but the next morning—February 12—he started with a "non-city breakfast" at another of his favorite haunts, 312 Chicago on North LaSalle. When it was time to eat again, he headed to a "non-city lunch" at Dillman's on West Hubbard. He topped off the day with a 6:30 to 8 PM "non-city" event at Naha on North Clark. For a mayor who boasts of creating the most transparent administration in Chicago history, Emanuel has made one thing clear: he intends to keep many of his doings out of the public eye, as our latest review of his daily meeting schedule shows. We've noted before that President Obama posts logs of White House visitors for the public to see. But more than four years after Emanuel left his job as Obama's chief of staff, his meeting schedule is still only obtainable through requests under the state Freedom of Information Act. And the most recent records that he's shared with us—spanning the first half of 2014, a time when his campaign fund raised more than $2.5 million—reveal even less about who has access to him than when he first took office. In 2011 we reported that the mayor's schedule was full of meetings with corporate CEOs, hedge fund managers, investment bankers, right-wing donors, and other millionaires. That continued to be the case well into 2012. 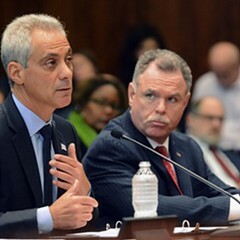 For instance, on February 23 of that year, Emanuel scheduled a half-hour meeting with Kenneth Griffin, a hedge fund manager and the wealthiest man in Illinois. Griffin and his wife have donated more than $430,000 to Emanuel and his affiliated political action committee, Chicago Forward. And on the 29th of that month, Emanuel found 20 minutes in the mayor's office for Ken Tuchman, the billionaire CEO of TeleTech, which specializes in helping businesses outsource functions like customer service. Tuchman later donated to Chicago Forward. By 2012 we weren't the only reporters looking into the mayor's calendar—the Tribune also FOIAed the material and began detailing Emanuel's meeting partners and their financial dealings with the city. The mayor's spokespeople responded by stressing that he was meeting with people who could bring more jobs and development to Chicago—the most important of public business. 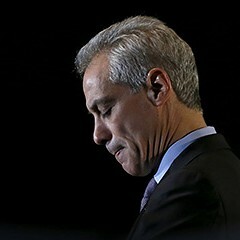 By 2014, though—after critics tagged him as "Mayor 1%" and his approval ratings were sagging—Emanuel and his staff determined that more and more of his daily meetings were no one's business. Certainly the mayor is allowed to take a break from his long workdays. But some of what his schedule described as private events involved employees on the public payroll. 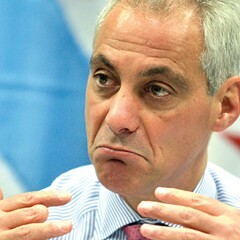 On March 26, 2014, for instance, Emanuel scheduled an 8:30 AM coffee with a "friend," and another at 5 PM. Both were held in the mayor's office, and both were attended by mayoral aides. Emanuel's press aides were unable to speak to us about the meetings or his schedule. A spokeswoman for the mayor's office told us she'd like to comment but didn't respond further. A spokesman for the mayor's reelection campaign didn't respond at all. The end result is that now there are multiple mayoral schedules. There's the public schedule disseminated every day to the media by the press office. It announces where the mayor will make public appearances, enabling camera crews to capture him posing with people he wants the public to know he's meeting with. For example, his schedule on Monday announced that the mayor would stop by the Office of Emergency Management to meet with city officials and "provide an update" on the city's response to the weekend blizzard. Next, there's his daily meeting calendar—the one that we and the Tribune received when we submitted our FOIAs. But since it has so many gaps, the calendar raises the question of whether there's a third schedule that includes the names of the mayor's coffee "friends" and the people at those "non-city" meetings. The mayor's daily meeting calendar doesn't omit the names of all the people he meets with. 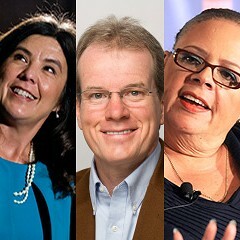 For the first six months of 2014, they included state house speaker Michael Madigan; Star Wars creator George Lucas, who was negotiating to bring his museum to the lakefront; and the Reverend Dennis H. Holtschneider, president of DePaul University, which is receiving tens of millions in public money to build a basketball arena in the South Loop. In addition, the mayor met with a number of black business and political figures—not surprising given that polls showed him faring particularly poorly among black voters. 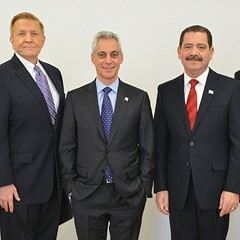 Just as he had in his first months in office, Emanuel set aside time for what he called his "kitchen cabinet," which includes some of the wealthiest and most prominent African-American leaders in the city: Avis Lavelle, who sits on the Park District board; CTA chairman Terry Peterson; and investors John Rogers and Jim Reynolds. The mayor also carved out time for a number of black and Latino state legislators, including Senator Kwame Raoul on April 23, 2014. 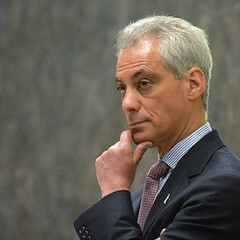 Raoul had helped kill Emanuel's proposal to lengthen mandatory sentences for gun possession, which would have sent more black and Hispanic men to prison even if they hadn't been connected to a violent crime. But Raoul says the gun issue didn't come up. Instead, he says the mayor wanted to express his appreciation after Raoul led a legislative committee on pension reform. "Basically, he was just saying thank you," says Raoul, who stresses that he's not endorsing anyone in this year's mayoral race. Emanuel's schedule also reveals the names of a couple corporate titans he sat down with. On June 13 he met with hip-hop mogul Russell Simmons—which, for some voters, is a step up from his hedge fund friends. Well, at least four of the five did.